"I would like to fight for a stage victory, and even though the finish to Sterling is missing, I am confident there will be some chances for me, so I’ll just take it day by day and see what happens." The 19th edition of the Tour Down Under will see 19 teams line up at the start for what promises to be a hotly contested race. The sprinters will have several opportunities to test their legs and get a maiden victory in the new season, but it will be once again the climbers and the puncheurs who are set to bring the race to life and fight for the overall win, with the stages to Paracombe (where the Tour Down Under will travel only for the second time in history) and Willunga Hill marked on the agenda by the riders who’ll vie for the ochre jersey. 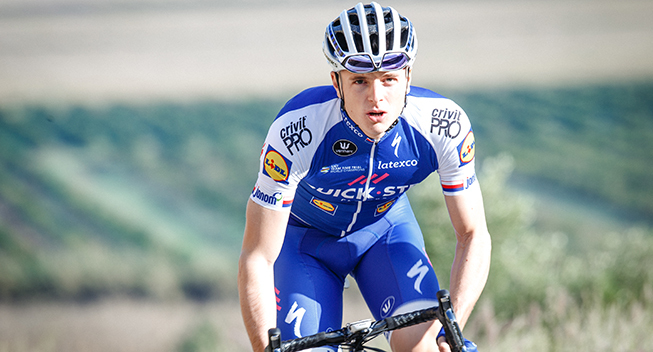 For the second year in a row, Petr Vakoc will be at the start of the World Tour opener as the leader of the Quick-Step Floors Cycling Team, and the young Czech, who in 2016 has enjoyed his finest season to date, is keen on making the most out of this opportunity. “It’s a nice race and I’m really looking forward to it. The organizers are doing a great job every year, the parcours is a very good one and the fans are always creating a fantastic atmosphere. Last year, it was the right decision to start my season here, and I hope things will go the same also this time. I would like to fight for a stage victory, and even though the finish to Sterling is missing, I am confident there will be some chances for me, so I’ll just take it day by day and see what happens”, said Vakoc, who last year came close of notching up a victory on stage 2, which he finished in fifth place. “I’m entering in my eighth pro year, and I’ve never before began the season so early. It will be a new experience and I’m curious to find out how I’ll cope with it. Now I feel good, but racing in a top event is totally different than training. It won’t be easy to make the transition from the European winter to the Australian summer, but we are traveling there early and I hope to adapt to the conditions”. Joining Gianluca Brambilla and Petr Vakoc for the 19th Tour Down Under will be 2015 Tour of Britain stage winner Jack Bauer, 2011 Giro d’Italia stage victor Eros Capecchi, Tour of Belgium and Tour de Wallonie champion Dries Devenyns, neo-pro Enric Mas and Martin Velits, one of the few Slovak riders to win both the road race and the individual time trial National Championships.